A patch of Owl's Clover provides a bright splash of color as well as nectar for insects. It blooms from March to May. 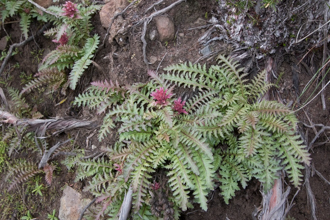 The flowers and bracts occur in dense spikes at the tops of the base-branched stems and are usually pinkish-purple, although white ones may be spotted infrequently. Leaves along the branching stem are pinnately cleft and the plant is covered with fine hairs. 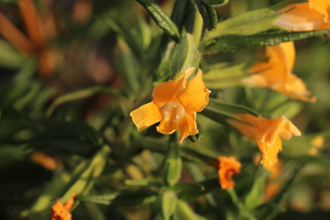 The plant is partially parasitic. 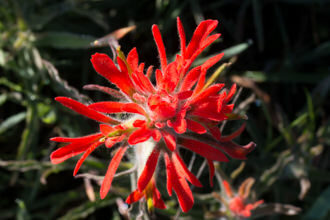 The genus name Castilleja is for 18th century professor and botanist Professor Domingo Castillejo. The species name exserta means "protruding". Sometimes Owl's Clover is placed in the Broomrape or Orobanchaceae family. 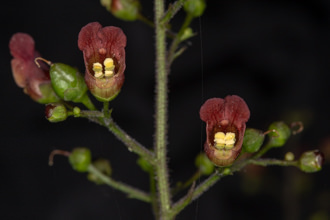 The Figwort family or Scrophulariaceae includes other common colorful paintbrush-like flowers like Indian Paintbrush and Indian Warrior, as well as the colorful and interesting-looking Monkey Flowers and Snapdragons. Last modified: May 12 2017 16:41:07.